Genuine Rolex Ladies Datejust Oyster Perpetual with custom made Salmon Diamond Dial and Diamond Bezel. Authentic Rolex Stainless Steel Jubilee Style Braclet. Model: Datejust. Bracelet: Rolex Stainless Steel Jubilee. BRAND Rolex MODEL Datejust Two Tone-18k Yellow Gold & Stainless Steel CASE Rolex Stainless Steel with Diamond Lugs 26mm BEZEL Custom 18k Yellow Gold Diamond Bezel (G-H color) DIAL Custom Ice Pink Dial with Diamond Hour Markers BRACELET Rolex Stainless Steel & 18k Yellow Gold Jubilee Bracelet Rolex Stainless Steel Folding Clasp Adjustable Size up to 6.5inches-Extra Links Available MOVEMENT Rolex Authentic Automatic Winding Movement CRYSTAL Rolex Scratch Resistant Sapphire BOX/PAPER Includes Rolex Box-No Paper CONDITIONS Excellent Condition-Polished, Overhauled, and Serviced WARRANTY Precious Timepiece & Co. 2 YEAR WARRANTY. Model 6917, 69178, 69173. Model6917, 69173, 69178. This bezel will fit on only ladies Rolex datejust models.All hand set diamonds for a flawless finish. Features. 90 ct of genuine natural diamonds. A classic ladies Rolex in great shape at a great price. Suitable for any occasion. Screwdown crown. NO HOLES case. No box or papers. Sapphire crystal. Trending at $3,548.00eBay determines this price through a machine learned model of the product's sale prices within the last 90 days. Rolex Datejust 26mm in stainless steel with a blue stick dial surrounded by 18k white gold bezel. “LOCAL PICK UP IS ACCEPTED AND REQUIRES. Y serial number. Model Number 6917. The original Rolex face has been Professionally Custom Refinished with Custom Added Pink Mother of Pearl Stone Stone and Custom Added Genuine Diamonds. Rolex Datejust. Manufacturer Rolex. BRAND Rolex MODEL Datejust Two Tone Yellow Gold/Stainless Steel CASE Rolex Stainless Steel with Diamon Lugs-26mm BEZEL Custom 18k Yellow Gold Diamond Bezel DIAL Custom White Mother of Pearl Dial with String Diamonds and Diamond Hour Markers BRACELET Rolex Stainless Steel & Yellow Gold Jubilee Bracelet Rolex Stainless Steel Folding Clasp Adjustable Size up to 7.5 inches-Extra Links Available MOVEMENT Authentic Rolex Automatic Winding Quickset Movement CRYSTAL Rolex Scratch Resistant Sapphire Crystal BOX/PAPER Includes Rolex Box-No Paper CONDITIONS Excellent Condition-Overhauled and Fully Polished WARRANTY Precious Timepiece & Co. 2 Year Warranty. ROLEX LADIES DATEJUST 26MM 179174 18K WHITE GOLD/STEEL SODALITE DIAMOND DIAL. The owner of this watch is certain to set themselves apart from the crowd with their contemporary, yet refined taste, and elegance. MODEL Datejust 68278. CASE SIZE 31mm. LSM Watch Inc. is an independent watch dealer and is not sponsored by, or affiliated with Rolex, Rolex USA or any of its subsidiaries. Rolex, Rolex USA and Rolex S.A. are under no obligation to warranty or service watches sold by LSM Watch Inc. This is a Genuine Rolex Stainless Steel Oyster Perpetual Datejust Watch with1.75 Carats Genuine Diamonds custom added to theBead Set Gold & dial. It has 10 Genuine Diamonds on theWhite Mother Of Pearl Dial. AUTOMATIC WRISTWATCH MODEL # 179174-SLVRO. - Rolex Caliber 2235. - Silver Dial. - 48 Hour Power Reserve. - Vibrations Per Hour: 28,800. Date Window Displayed at 3 O'Clock. - Solid 18k White Gold Fluted Bezel. Authentic Rolex Two-tone Ladies 26mm Datejust 69173 Purple with Diamond Dial. MODEL Datejust 69173. L Rolex, Rolex USA and Rolex S.A. are under no obligation to warranty or service watches sold by LSM Watch Inc.
Ladies Rolex DateJust 79173 18K Gold 26mm NO HOLES Linen Champagne Jubilee Watch. Rolex Fluted Solid 18K Yellow Gold Bezel. Rolex Silver Diamond Dial. Rolex watch case and outer box. (Pictured). We were voted BEST of Long Island from 2015 - 2018! This Rolex is inSUPER EXCELLENT CONDITION. Model No. 6917. Dial Rolex GOLD CHAMPAGNE dial with raised yellow gold stick markers. Bezel Rolex solid 18k yellow gold FLUTED bezel. Case Rolex solid 18k yellow gold case. Solid 18k Everose Gold with 904L Oystersteel Stainless Steel Jubilee Bracelet. LUXURY WRISTWATCH MODEL # 179161-SLVSJ. - Rolex Caliber 2235. - Silver Dial. - Second / Minute Markers. - Index Hour Markers. ROLEX - Ladies 18kt Gold & SS Datejust - Rhodium Roman Dial - Model 79163. This is the 26mm Rolex Datejust model 79163: This is the style with the Rolex 18kt Gold & Stainless Oyster bracelet. SANT BLANC warranty is for a full three years. Jubilee bracelet. P serial number circa 2000. Custom Tahitian Mother of Pearl Diamond Dial. Dial Color. Stainless Steel. 2 Year JIT Warranty. Manufacture Year. We are real people, working at a brick and mortar location, at your service. LADIES ROLEX DATEJUST MODEL 69173 WATCH. STAINLESS STEEL & 18K JUBILEE BAND. LADIES ROLEX DATEJUST 69173 WATCH. STAINLESS STEEL & 18K JUBILEE BAND. Model: 69173. Style: 1991 Ladies Rolex Datejust Wrist Blue Dial Watch. We will make sure you are satisfied! We will make every effort to accommodate this request if possible. Here is a STUNNING LADIES ROLEX DATEJUST DIAMOND CHAMPAGNE 179163 with the oyster bracelet in very good pre-owned condition. It's as easy as that! Series DateJust. The watch consists of a total of6.0 Ct of all Clear diamonds set on the bezel, case and the bracelet. This genuine rolex watch has a one row diamond bezel added to it in a pave setting. Excellent preowned ladies Rolex Datejust (ref. 179178; Y-series - 2002) in 18k yellow gold features Rolex factory champagne dial with 10 diamonds, fluted bezel and President bracelet. 18k Yellow Gold. SS/18K White Gold Ladies Datejust model #179384. Included: Rolex storage box, warranty card, and booklets. • Gold Crystal dial with Diamond hour markers. • 18K White Gold bezel set with 46 diamonds. • 26mm Stainless Steel case. BRAND Rolex MODEL Datejust Stainless Steel CASE Rolex Stainless Steel-26mm-Polished BEZEL Custom Diamond Bezel (G-H color) DIAL Custom Silver Dial 10 Diamond Hour Marker BRACELET Rolex Stainless Steel Jubilee Bracelet Rolex Stainless Steel Folding Clasp Size 6.5inch-Additional Links Available for purchase- MOVEMENT Rolex Automatic Winding Movement CRYSTAL Rolex Scratch Resistant Sapphire Crystal BOX/PAPER Rolex Box Included-No Paper CONDITIONS Excellent Condition-Overhaul and Full Polish WARRANTY Precious Timepiece & Co. 2 YEAR WARRANTY. MODEL Datejust Stainless Steel. BRACELET Rolex Stainless Steel Jubilee Bracelet. DIAL Custom Jubilee Dial 10 Diamond Hour Marker. This is a Pre-Owned & Authentic Rolex watch. CASE Rolex Stainless Steel-26mm. This 29mm Rolex solid gold watch is in excellent condition. Worn on special ocassion only. Comes with papers and the big original Rolex jewelry box that has the two extra links. Never opened or polish. Band is tight to no wear at all with only has minute normal wear that can be easily polish a little bit. Please check all my feedback for you peace of mind purchasing this watch. Ladies Rolex Date Two-Tone Jubilee Watch. Rolex Champagne Dial with the date at the 3 o'clock. Rolex Fluted Solid 18K Yellow Gold Bezel. Gender Ladies. Era Modern. Box Yes, this item includes an elegant cushioned presentation watch case. Trending at $3,528.00eBay determines this price through a machine learned model of the product's sale prices within the last 90 days. MODEL Datejust Two Tone-18k Yellow Gold & Stainless Steel. CASE Rolex Stainless Steel with Diamond Lugs 26mm. BRACELET Rolex Stainless Steel & 18k Yellow Gold Jubilee Bracelet Rolex Stainless Steel Folding Clasp. Authentic Two Tone Rolex Jubilee Style Bracelet. Model: Oyster Perpetual. Bracelet: Authentic Rolex Two Tone Jubilee style. We are not affiliated with Rolex S.A or any other watch manufacturer. Gender: Ladies. Ladies Yellow Gold Datejust President Authentic Rolex with 18k Yellow Gold Rolex Bracelet. I don't know how to disassemble it to get the serial number so I'm not sure of its exact age. Easy To Read Dial. Lady's 18K Yellow Gold Rolex "President" # 69178. Item #: CT35538 Brand: Rolex Model: President Reference No: 69178 Circa: 1990's Production Gender: Lady's Movement: Handmade Swiss Automatic Movement. Case Measurements: 26mm Dial: White Markers: Yellow Gold Roman Numerals Bracelet: 18K Yellow Gold Rolex "President" Hidden Clasp Bracelet. Features: Sweep Second Hand, Date Indicator, 18K Yellow Gold Fluted Bezel, QuickSet Movement and Sapphire Crystal. Includes: Rolex Box, Booklets, Hang Tag and complete with Capetown's Lifetime Watch Warranty. Condition: Like New Price: $6,990 Click on a thumbnail to view a larger version. Any Questions, Call Description Lady's 18K Yellow Gold Rolex "President". # 69178 White Dial with Gold Roman Numerals, Center Sweep Second Hand, Date Indicator. Up for sale is an authentic ladies Rolex Date model number 69173. Ladies Rolex Date 69173 Stainless Steel. Model Number: 69173. We're not affiliated with Rolex USA or Rolex International. We do are best to replace worn gaskets to insure they are sealed. Here is a STUNNING LADIES ROLEX DATEJUST 79160 STICKS SIZE 7 with the oyster bracelet in very good pre-owned condition. It's as easy as that! Series DateJust. The watch consists of a total of7.0 Ct of all Clear diamonds set on the bezel, case and the bracelet. This genuine rolex watch has a one row diamond bezel added to it in a pave setting. ROLEX - Ladies 18kt and Stainless DateJust - White Roman Dial - 179173. This is the Rolex DateJust model 179173 26mm size DateJust: This is the newest style with the heavy genuine Rolex 18kt Gold and SS bracelet. This unique and rare Ladies Rolex. The pictures speak for themselves! 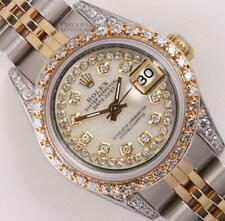 This Ladies Rolex Certificate of Appraisal States: Ladies Rolex 18K Gold DateJust with 18K Gold Italian 4.00CT T.W. President Bracelet and Diamond Dial and 1.00CT T.W. Diamond Bezel. ​​​​​​​Champagne Dial - 69173. Rolex Ladies Datejust Stainless Steel/Yellow Gold. Ladies Datejust. Rolex Specifications. We also provide a 4-year warranty if the factory warranty is expired! Stainless steel case with a 18kt yellow gold and stainless steel jubilee bracelet. Trending at $3,449.98eBay determines this price through a machine learned model of the product's sale prices within the last 90 days. Make: Rolex Model: 18K/SS Datejust Ref#: 69173 Series/Manuf. Date: Circa 1984 Bezel: 18K yellow gold fluted bezel. Dial: Champagne color dial. Bracelet Type/# of links: 18K/SS Jubilee bracelet. Crystal: Sapphire Condition: Excellent condition. Ladies Two-Tone Rolex Datejust. You are viewing an authentic Rolex original. Rolex Automatic with Date. Genuine Rolex Two-Tone Jubilee Bracelet. This Rolex watch has been recently professionally buffed and polished, it looks like new. Authenticity / Reference #: 179160. Model: Datejust. The case is highlighted by a polished steel bezel. Pre-owned and in excellent condition, with minor signs of wear. Water resistant to 100m. Case Type: Stainless steel. MODEL Datejust Stainless Steel. This is a Pre-Owned & Authentic Rolex watch. CASE Rolex Stainless Steel-26mm. BRACELET Rolex Stainless Steel Jubilee Bracelet. Rolex Stainless Steel Folding Clasp. CRYSTAL Rolex Scratch Resistant Sapphire, Date. This is a 100% Genuine Rolex Stainless Steel Oyster Perpetual Datejust Watch with 2.5 Carats Genuine Diamonds custom added to the Bezel and Dial. The original Stainless steel case is in excellent condition with no Dings, Dents or deep scratches. Series DateJust. The watch consists of a total of9.75 Ct of all Clear diamonds set on the bezel, case and center links of band. This genuine rolex watch has a one row diamond bezel added to it. The bezel consists of fully faceted round brilliant diamonds in aSI1-SI3 Clarity. Make: Rolex Model: Datejust Ref#: 69160 Series/Manuf. Date: "T" series circa 1997 Bezel: SS smooth. Dial: White dial with Roman hour markers. Other dials available. Bracelet Type/# of links: Stainless steel Oysterbracelet. Model DateJust. Rolex Black Tapestry Stick Dial. Rolex Scratch-Resistant Sapphire Crystal. Rolex Fixed Smooth Solid 18K Yellow Gold Bezel. Box Yes, this item includes an elegant Rolex presentation watch case with an outer box. 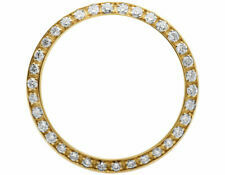 Genuine 18K Solid Yellow Gold Presidential style bracelet.All Diamond are high quality. Model: Datejust. Bracelet: Authentic Rolex 18K Gold Presidential style bracelet. We are not affiliated with Rolex S.A or any other watch manufacturer. ROLEX - Ladies 18kt WG & SS Datejust - Mother of Pearl Diamond Dial - Model 179174. This is the Rolex Datejust model 179174 26mm size Datejust: This is the newest style with Stainless Steel Oyster bracelet. Authentic Rolex Stainless Steel and Gold Jubilee style bracelet. All Diamond are high quality. Model: Oyster Perpetual. Bracelet : Authentic Rolex Gold Stainless Steel Jubilee style bracelet. We are not affiliated with Rolex S.A or any other watch manufacturer.